DBcloudbin is designed for reducing your database size by moving binary content (those documents, images, pdfs, …) that many applications store at the database, to a optimized and cheap cloud object storage. The nice part is that you don’t have to modify your application to do that. We take care of you application data model to make it compatible with the SQL interaction from your application layer, while enabling you selectively to move content outside of the database, reducing dramatically its size (and, as a logical consequence, the infrastructure and operational costs). Check our detailed savings information and calculator. Just download, setup and & move your data to the Cloud! DBcloudbin is simple and effective. You have to run the installer, identify the database schema of your application, select the tables with binary (BLOB) content that are suitable of moving to our object store and it is all set. We provide a CLI command (dbcloudbin) to execute the common tasks as executing archive operations (dbcloudbin archive). In this scenario, you just define the subset of your managed tables you want archive based on SQL logical conditions and (optionally) the -clean argument to erase the BLOB from the database freeing its consumed space. The data is securely stored in our Cloud Object Store and a reference of the location (as well as a encryption key) is saved in your database. When your application issues a SQL query (the same query the application did before dbcloudbin installation), if the data is present locally, it will be served locally; it if is stored at our Cloud Object Store, the database will silently fetch it from our system and serve it to the application, as if it were locally, just with a slightly higher latency. From a application perspective, no changes. We take very seriously security, both from a data access/data loss perspective and from a data integrity perspective. Check our detailed information on security and data integrity. Check out our trial and register for the service. We will provision 5GB for free for you in our Cloud Object Store, send you the link to our installer and the service credentials. Identify a non-production Oracle database and your application instance where you can test the solution. Run our setup wizard. It will do everything for you, including the datamodel adaptation… Check for detailed setup instructions. Test your application to check that it keeps working as expected. Run the dbcloudbin archive command to move the subset of content that you decide to our Object Store. Check how the application behaves… it is transactionally consistent, you can do it with your application online! Where you can use DBcloudbin? You are a company with large Oracle, SQL server, DB2UDB databases (currently we support Oracle; other DBMS coming shortly). Some of the applications storing data are internally develop (or at least internally controlled). Our solution would in most cases work for closed-source commercial apps, but the typical license agreements will prevent the data model modifications we do for integrating with an external Cloud Object Store service. A relevant amount of content stored by application is binary content (documents, videos, pictures, ….) and is stored in the database. You have a non-production environment where you can test your application compatibility. Not sure if your database meet the criteria? Run our RoI tool to check sizing of potentially archivable and get the potential saving figures! Our architecture is neat and simple. All the complexity is hidden under the covers. We use an DBcloudbin agent (installed as a service in a Windows or Linux host) to act as a bridge between your database and our Cloud Object Store service. A ‘dbcloudbin’ user and schema in your database will hold the configuration settings. The installer will adapt your application’s database model to be able to hold the identifiers of the content moved to DBcloudbin Object Store and keep it ‘SQL client compatible’ (so the existing queries, insert, update and deletes your application was issuing before installation, keep working with the new model). And that’s all!! Insert operations go always to the database. Moving data to the cloud is an asynchronous, decoupled operation. No impact. Read operations of binary data (documents, pictures, …) are in most cases a ‘human action’ (e.g. an operator opening a document in a web interface). Human interactions are in a order of magnitude of seconds, where databases work at millisecond scale. A slightly higher latency you may suffer (providing you have a reliable and performant Internet connection) are almost imperceptible for the human interaction. Our solution is backed by a top-class Google Cloud Platform infrastructure with high-end, redundant and parallel service infrastructure. The dramatic reduction in size in your database after moving the ‘fat’ data to our storage, will produce among other benefits, a much faster processing of those relational queries that do have real impact on performance (e.g. listing or filtering or reporting data in your application by different criteria). So the end-user will perceive a much more responsive application. Only you :-). More precisely only your database schema and those database users you have allowed to do so. We don’t break the RDBMS security model, so your data keeps as secure as it was before. The same users and roles that had access to the data, will keep having access, and no other ones. When moving data to our Cloud Object Store service, we generate a secure random key to encrypt the content with a secure AES cipher on the fly, storing the key at your database table. So the content lands in our service ciphered, with no possible access to the key. In addition, the transmission channel is secured with an SSL connection. So, yes, you still have to keep backing up your database; if you loose your database you loose your keys (and hence, your content). But baking up your database with a e.g. 80% reduction in size (the content reference is just a few bytes) is a much easier (and cheaper!) story. No problem, we have a pluggable architecture where our solution can talk with a variety of Object Store technology from the main manufacturers (Hitachi, Dell-EMC, IBM,…). We can provide you a custom implementation on-premises. Just contact us and tell us your requirements. That’s fine. We can provide you the logic of the service and you provide the storage directly from your Cloud Service Provide. We support S3 object store as of today. We can provide you a virtual appliance with our solution deployed in your own service provider account. Again, contact us and tell us your requirements. 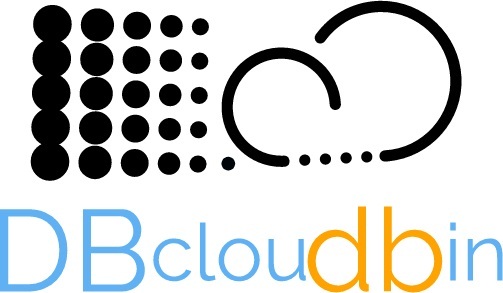 Are you a service provider and want to include DBcloudbin service in your portfolio? contact and we will discuss further.